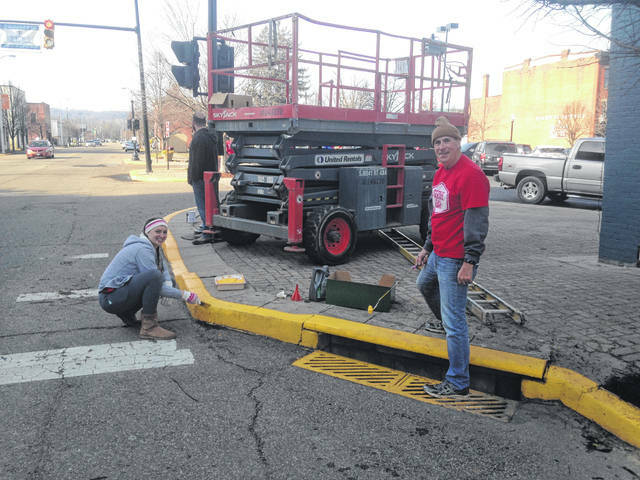 Tom Bennington and Ashley Hickman, both Life Point Church volunteers paint the curb at the edge of Second Street and Market Square. On this corner you will find Santa’s Workshop and Candyland. 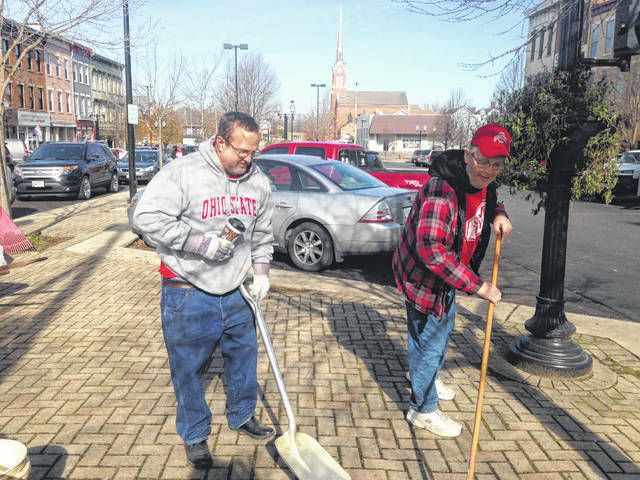 Brandon Hurt and Brian Kimmey cleaning up the streets on Market Square. Volunteers build the frame for the ice skating rink that will be open to the public beginning Saturday, December 1. The small buildings in the picture on the left will be set on the open lot for the Christmas Village filled with vendors on the weekends. Randy Nickles, organizer of the Life Point Church volunteers stands on the ladder helping others trim the tree. 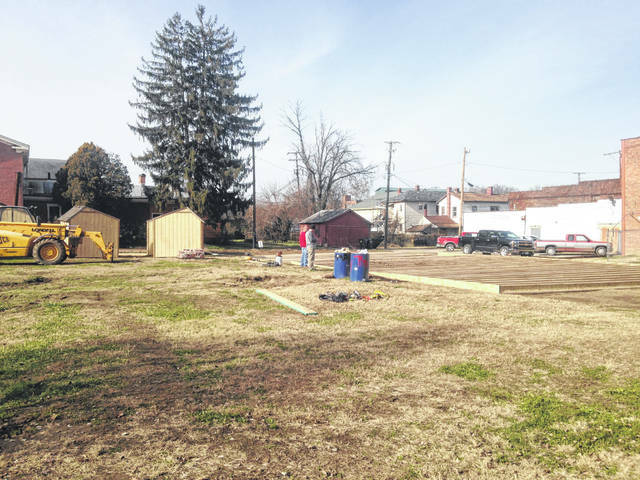 With just one week until the start of Winterfest, volunteers took advantage Friday’s weather. People from Life Point Church, Edward Jones, Graf Brothers, E-Flow Development, PSKC, Friends of Portsmouth and others wielded paint rollers, shovels, rakes, leaf blowers and whatever tools necessary to transform local streets. 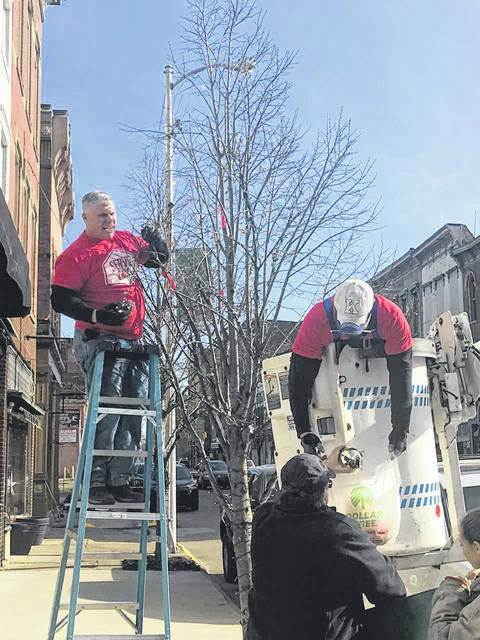 “This block was assigned to us to decorate for Winterfest,” said Tom Bennington, of Life Point Church. He worked along side of Ashley Hickman who was also part of that group. According to Nickles that part will be on the vacant lot located almost directly across from Ghosts in the Attic on the north side of Second Street. Similar to the historic drive-in, the movie of the nativity will be projected onto the side of the building for families to watch while the kids feed the animals. You can take a walk through Santa’s Workshop complete with a gift shop and photo op with Santa. Candyland is sure to be a treat located next door to it on Market Square. Both are housed in renovated buildings. Tim Wolfe, of Friends of Portsmouth was found working near the ice skating rink. He explained the small buildings will fill the rink’s lot as the Christmas Village and will have vendors. There will be a stage along with benches for the world record setting day and seating to watch the skaters. Some activities will only be open on the weekends but the rink will be open all day starting December 1. To volunteer contact Tim Wolfe or for more information visit the Friends of Portsmouth social media page.